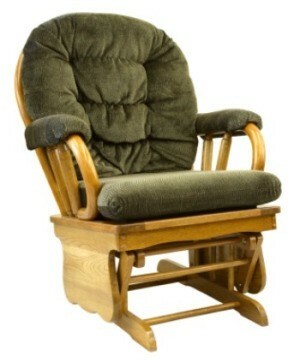 Many glider chairs have fabric upholstered cushions that may need to be replaced long before the chair itself. This is a guide about finding glider chair replacement cushions. I can't seem to find replacement cushions for my glider rocker. Babies R Us has them, I am pretty darn sure. And I seem to recall a friend of mine had the JcPenney home furniture (or could have been Sears, but one of those) catalog and you could buy all different kinds in there. I tried to find glider chair cushions, also- with no luck. So, since my foam cushions have removable covers with zipper, I took the cushion covers off and fluffed the cushions in the dryer on the air cycle. I washed the covers, and my next project will be to try to rip the seams and lay the old cushion cover material out to use as a pattern. But instead of a zipper for the new covers, I am going to use velcro. The material I'll be using is from an unfitted chenille slip cover for a large sofa, which I found at Big Lots at a good bargain price. I haven't been able to find these at Babies R us or at JC Penney. I, too, am looking for replacement cushions for my glider rocker. I checked all of the sites mentioned here and many more. The only one that came close was Sear's replacement cushions for a regular rocking chair. Costs for custom made cushions are greater than purchasing a brand new glider. What a shame. I found some on the Pottery Barn Kids website. They have many different fabrics. They are expensive but I bought a really nice hand made Glider 6 years ago with my 1st son. So, I'ld rather not buy a new glider. I have samples for a Newport glider but do not have the page with the company info. Anybody know? here is a store that sells them and has many to choose from instock http://www.blanchetrocker.com/ I just spoke to the guy and he is happy to help. I found a great selection for my front porch rocking chairs at www.cushionsource.com. They have a good selection of indoor and outdoor fabrics designs. They offer many styles including cording and ties. The quality price and delivery time was better than expected. I bought a chair off Craigslist and need to replace the cushions. I found that both McCalls and Simplicity make patterns for glider cushions. It's worth it to me to give that a try rather than pay twice what I paid for the chair to cushion it. You could also try getting a cushion from Ikea. Their Poang chair cushion works beautifully in our glider. It's not the same shape, but functionally it works great, and they have lots of colors. CJS Cozy Cushions (http://www.cozycushions.com/) offers cushion made cushions for glider rockers, swings, sofas, love seats and more. This has become such a disposal world, having a hard time finding replacement cushions for a glider rocker, I am not going to buy another rocker. Just need the cushions. You may be able to pay a seamstress to recover the ones you have or you may be able to do it yourself, making a pattern from the current covers? AFter going through all of these websites, I found this fella to be the most helpful. It turns out he gets calls for replacement cushions about 10 times a week or so and ends up shipping all over the country. (He's in New Hampshire, and I'm in California and the price was decent). Rocker World seems to have gone out of business. Hey gals, just found this wonderful site on ebay for slipcovers for my round top glider rocker chair cushions. They fit like a glove are reasonable priced and are beautiful! I used my old cushions so the shipping was so low. I just purchased a Christmas red for the HOLIDAYS! Two ladies have a ebay site where they make and sell reborn babies clothes and bedding and also these wonderful slipcovers. They are just So helpful!! You can find them on ebay by searching seller name shabbychenilleladys or just go to ebay and search glider rocker slipcovers. The Comfortable Chair Store has the best selection of replacement glider cushions I've been able to find and they are located near me in the Metro Atlanta area. It's run by a husband and wife team who are very knowledgeable and helpful. I bought there after two of my friends referred them to me. Their website is being changed at the moment but the address is www.TheComfortableChairStore.com Hope this helps! I am looking for replacement cushions for a swivel wingback glider rocker (ottomon too if possible). I can't seem to find them anywhere. Any suggestions? I can't find a replacement pad for my wing back glider and the ottoman. I have a Best Chairs Inc. #C8107MO glide rocker. I wanted to find replacement cushions for it. It looks like the same rocker as the picture on your webpage. How would I get the replacement cushions for this rocker? 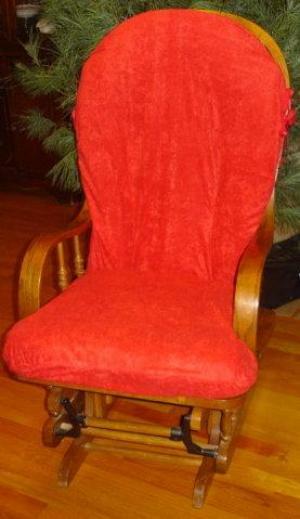 I am trying to find someone who sells replacment cushions for the Bow Back Glider rocking chairs. These chairs are everywhere, surely someone sells the cushions separately. My chair back measures 30 inches tall by 20 inches wide at the top and 17 inches wide at the bottom. The seat cushion is a slight "T" shaped that measures 18 inches in the back, 18 inches in length and 23 inches across the "T" in the front. I would really like to replace the cushions that came with my chair. The chair is in great shape but to find the cushions has been a real challenge. Any help would be appreciated.